Holes in Your Heat Shield? No Problem! It seems like a no-brainer, even to non-rocket scientists: wouldn’t even one hole in a heat shield be one hole too many? The heat shield is there to protect the crew cabin from the compressional heating of the air during re-entry into Earth’s atmosphere. When a space capsule returns from low Earth orbit, it rams into the thin atmosphere at 100 kilometers altitude at orbital velocity, nearly 8 kilometers per second (Mach 25, or 25 times the speed of sound). In 1951, H. Julian Allen and A. J. Eggers, Jr., of the National Advisory Committee for Aeronautics (NACA) discovered that a high-drag blunt shape made the most effective heat shield for atmospheric entry. They found that the greater the drag of a re-entry vehicle, the less the heat load. During high-speed atmospheric entry, the blunt leading face of the capsule piles air up in front of itself, pushing the shock wave of compressed, heated air away. Compression heats the gas to over 1,100°C (2,000°F) (ref. 1). Since most of the super-hot gases are not in direct contact with the vehicle, most of the heat energy stays in the shocked gas flowing around the vehicle and dissipates into the atmosphere. Still, the radiant heat from the hot gas could melt the spacecraft’s internal structure (ref. 2). Therefore, most space capsules typically rely on thermal protection materials which burn and char away in the air flowing past the capsule, carrying away the heat (ref. 3). Reusable vehicles, like space shuttles, have advanced thermal protection which insulates the vehicle’s structure from the heat without burning away itself. 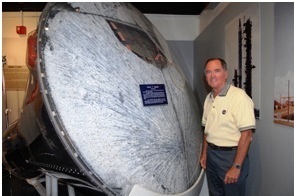 Failure of the heat shield can mean loss of vehicle, loss of mission, even loss of life. In 1962, a faulty sensor misled Mercury control into believing that the heat shield on John Glenn’s Friendship 7 capsule was prematurely detached, and America held its breath waiting for him to radio that he had survived re-entry. In 1967, an unmanned Soviet Soyuz test capsule disintegrated during entry when an improperly sealed access port in its heat shield accidentally opened up (ref. 4). Thirty-seven years later, after decades of uneventful re-entries, the world was stunned when the NASA space shuttle Columbia was lost after an accidental hole in a thermal protection panel allowed super-heated atmospheric gas to melt the aluminum internal structure of her left wing. Given that zero holes in the heat shield seems like the right number, why have some spacecraft had any holes in their heat shields at all? The most commonly demonstrated reason has been that it made it easier to land a 100-ton space plane-turned-hypersonic glider on a runway. On 133 occasions between 1981 and 2011, after blistering re-entries, the five NASA shuttle orbiters each opened four door panels covering three holes in their heat shields to extend their landing gear just before landing on the runway and rolling safely to a stop. (Earlier, shortly after reaching orbit, the shuttle orbiters also closed two doors in their heat shields which covered fuel line connections between the disposable external fuel tank and the main engines; thus, each orbiter had five holes in the heat shield opened at some point in flight.) The Soviet orbiter named Buran also extended its landing gear through its heat shield, during its only flight in 1988, and the U.S. Air Force X-37B experimental mini-shuttle has also done it once (so far), in 2011. Other vehicles incorporated holes in their heat shields because they eased the way for astronauts or cosmonauts to move from the space capsule into a module carried behind the capsule. This was the case for the US Air Force’s Manned Orbiting Laboratory (MOL) and its Gemini crew capsule, and of MOL’s Soviet equivalent, the Almaz space station, with its TKS-VA capsule and TKS-FGB cargo module. In 1966, a previously-flown Gemini capsule, with a simulated 0.7-meter hatch cut through its heat shield and then resealed, weathered a high-speed ballistic entry at 7.8 kilometers per second with no difficulty. Between 1976 and 1983, six Soviet TKS-VA capsules being tested for eventual service with the Almaz stations made ten successful orbital-speed entries (one flew four times; another, twice), each with a resealable hatch in the center of its heat shield. The Gemini has since gone the way of the dodo, but the TKS-VA has been proposed as a 21st-century space station taxi and tourist vehicle (ref. 5). Designers who could not get comfortable with holes in their heat shields had to make expensive concessions to their unease. For example, the Russian Soyuz and the Chinese Shenzhou both have habitation modules mounted above their crew capsules atop the booster rocket. Thus, their launch escape rockets, designed to extract the crew capsules away from an exploding booster, also have to be strong enough to lift the intervening habitation module away as well. If the habitation module were below, connected through the heat shield, instead of above, then the escape rocket would only have to lift the crew capsule and could be smaller and lighter—which would in turn allow more useful payload to be carried on each launch. Interestingly, there were considerations early in the Soyuz (ref. 6) and Shenzhou (ref. 7) development phases to do just that, but the designers opted instead for the heavier option at least partially because of concerns about holes through the heat shields. Other alternatives have also been considered. Two early concepts for transfer between Gemini and MOL evaluated space-walking between the modules or extending an inflatable tunnel from one module to the other (ref. 8). Both those options were discarded as even riskier than the hatchway in the heat shield. Finally, there is still another option. If the design decisions include (1) crew capsule above habitation module at launch for safety, and (2) capability for internal transfer between connected modules, but (3) no connecting tunnels through the heat shield, then the only solution is to provide the crew capsule with a heat shield on its top instead of its bottom. Since the astronauts would be reclining in their seats inside the capsule before and during launch facing upward toward the heat shield, but would need to be facing away from it during re-entry, their seats would have to pivot like hammocks so they were always pushed into their seats by the high g-loads of launch and re-entry. Capsules with swiveling seats have been proposed as early as 1958 (ref. 9) and as recently as 2005 (ref. 10), but not as part of a capsule/hab module stack launched on the same rocket. History shows that, as critical as intact heat shields are, resealable penetrations through them have not been uncommon. Still, there are several alternate approaches to permit inter-vehicle astronaut transfers. Spacecraft designers have usually opted for those that go “around” instead of “through”, even if it means heavier spacecraft, more complicated in-flight procedures, and costs more in the long run. __, http://en.wikipedia.org/wiki/Aerodynamic_heating, last accessed 23 April 2012. __, http://en.wikipedia.org/wiki/Space_Shuttle_thermal_protection_system, last accessed 25 April 2012. __, Atmospheric Reentry Physics: Development, Validation and Uncertainty Quantification of Ablation Models, February 3-8, 2013, Four Points Sheraton / Holiday Inn Express, Ventura, CA, http://www.grc.org/programs.aspx?year=2013&program=atmosentry, last accessed 22 April 2012. Cosmos-140, Feb. 7, 1967, in Siddiqi, A.A., Challenge to Apollo (Washington, D.C.: NASA, 2000), p. 576. Floyd, Jamie, M.D., "Assessment of the Almaz Capsule for Space Station Assured Crew Return (ACRV)", McDonnell Douglas Aerospace MDC 97W5151, January 1997. Soyuz 7K-VI, in Siddiqi, A.A., Challenge to Apollo (Washington, D.C.: NASA, 2000), p. 597-8. __, "Why Do China's Shenzhou-Series Spaceship Use 3-Module Layout? ", www.sina.com.cn in Chinese, 22 July 2011. MOL transfer concepts, described in Gatland, K., Space Technology (New York: Salamander Books Ltd., 1981, 1982), p. 77. Martin Co. concept, in Miller, R., The Dream Machines (Malabar, FL: Krieger Publishing Co., 1993), p. 474. Transformational Space Corp. (tSpace) Crew Transfer Vehicle CXV concept previously described at http://www.transformspace.com/Welcome.html, site under construction when checked on April 29, 2012. See http://www.astronautix.com/craft/cxv.htm (accessed April 29, 2012).